This blog is taking on a life of its own. It’s expanding. It started out as a way of recording my experiences as a trainee garden designer at KLC. But along the way other things have crept in. And recently they’ve been threatening to take over. But I don’t want you to think that, just because it’s the summer holidays, the course work is taking a break as well. Oh no…. Because there’s the dreaded Construction File to complete, which I’ve been working on since term ended. I’ve still got 11 CAD drawings to do – which I keep putting off, because CAD and me are not exactly what you could call the best of friends… and I know it’s going to be painful. Then there’s the work experience. Regular readers of this blog may remember that I was supposed to be going to Great Dixter for two weeks. I had to pull out of this because my father in law died, but I did get to spend a wonderful week at Long Barn, Vita Sackville West’s first garden after she left Knole. Of which more to come in later posts…. And running alongside everything else this summer is the project that we have to be ready to present on our first day back in September. Which is no small ask…. This week I’ve been working on the 3D model we have to make as part the project. And it’s been a tortuous experience. There are people out there who are good at this sort of thing. I’m not one of them. I went out last weekend and spent my life savings on tissue paper and plasticine, and anything else that looked like it might help me to build my dream garden in miniature. On Monday morning I went to the little shed in the garden where I work feeling quite excited. The excitement lasted about five minutes. By Wednesday morning I was on the verge of packing the whole course in. You should have seen the state of my shed. There were bits of torn up tissue paper, drinking straws cut into pieces, broken cocktail sticks, lumps of plasticine, cardboard. It was like the scene of an explosion in the Blue Peter studio. Which is ironic. Because explosions are what my project is all about. Crane Park in Twickenham, the location of Project Number 4, is the site of a gunpowder mill which closed down in the early 1900’s. Making gunpowder is a dangerous business. While the mill was in operation there were numerous explosions, some of which could be heard as far away as Heathrow. And over the lifetime of the mill seven workers died. It was this aspect of the site that caught my attention. So, at the start of the holidays, I began to research explosions. And while I was away in Majorca I spent many happy hours on the internet (feeling uncomfortably aware that some big brother somewhere was aware of the person in Puerto Pollenca typing ‘gunpowder’ and ‘the aftereffects of explosions’ into Google). And this was how shock waves became the theme of my summer. but because it made me smile. 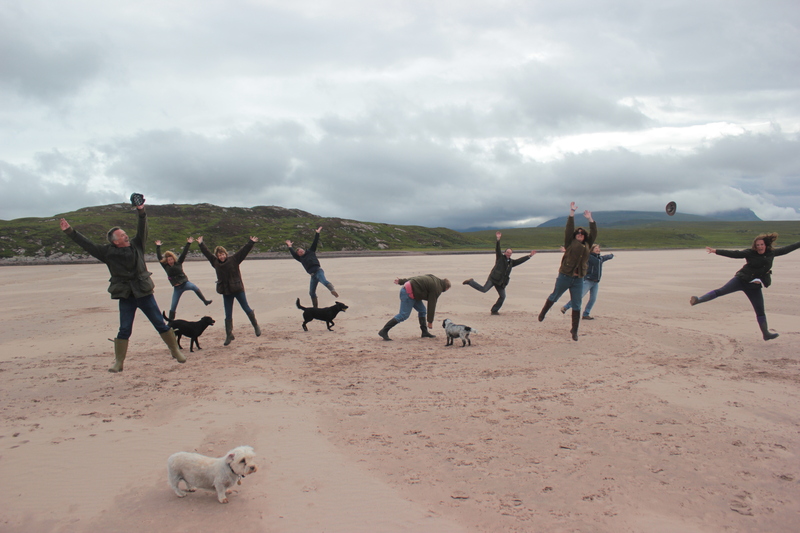 And I got this idea in my head that while we were in Scotland I should try and persuade the rest of the group to re-enact a ‘shock waves’ moment on the beach up there. 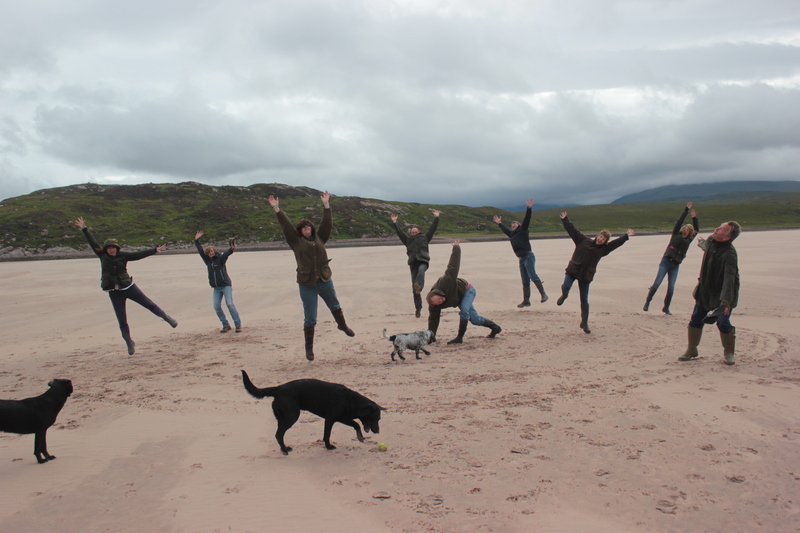 Which is how it came to pass that, if you had been on the Achnahaird beach near Alchiltibuie on a particularly blustery day a couple of weeks ago, you might have been a little surprised to see ten fifty somethings drawing circles in the sand and leaping into the air. 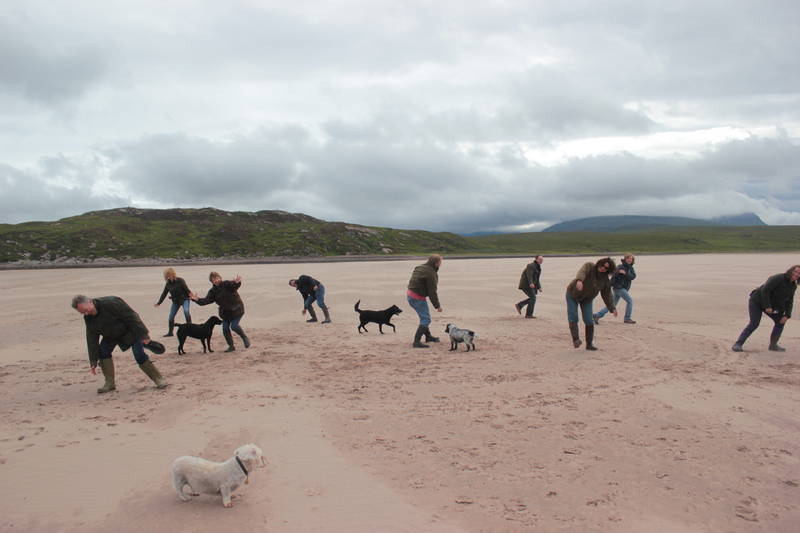 Don’t think the dogs quite get it…. 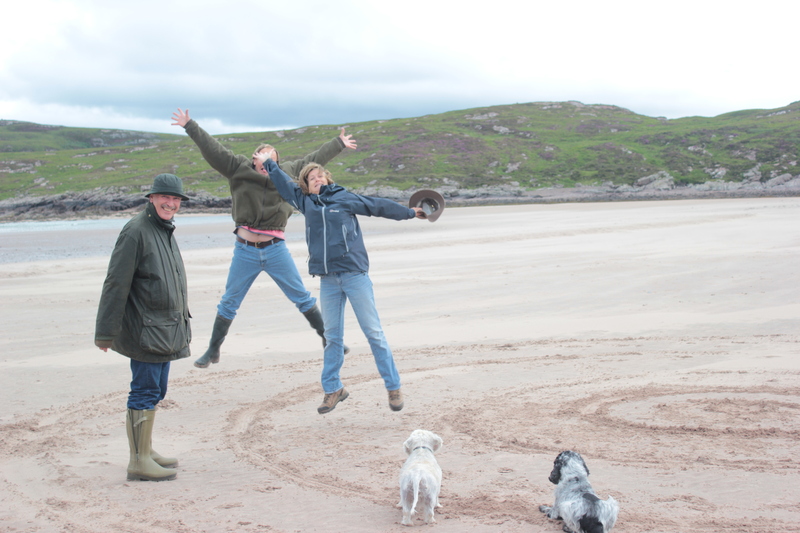 Ok so maybe the jumping isn’t quite as accomplished as the original…. 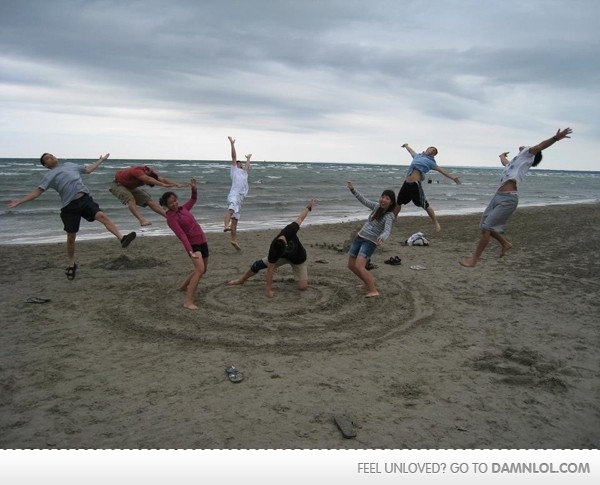 But if anyone else happens to find themselves on a beach with nothing better to do…. Just remember you don’t have to be young to have a laugh. Just back from a wonderful week in Mallorca and back to Sussex with a bump and realisation that the next two weeks will be busy! I love these pictures – your laughter makes me laugh! 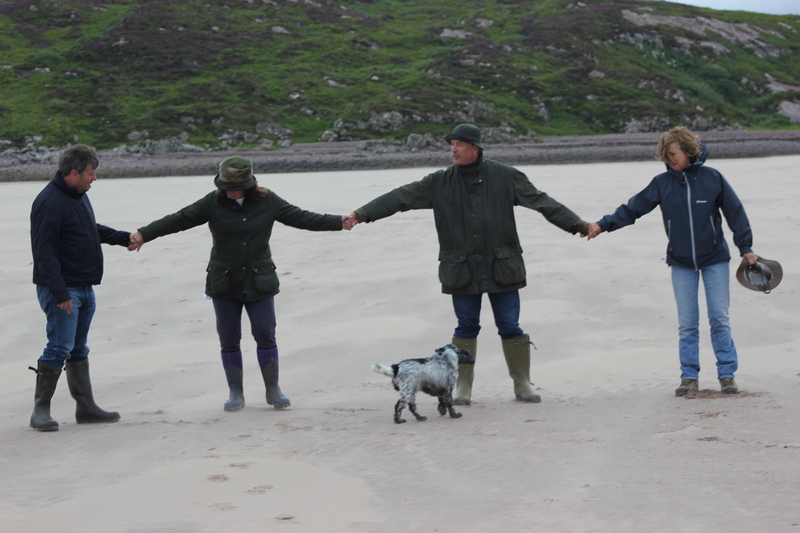 Had a wonderful trip to Altnaharrie a thousand years ago ….. an incredible spot …… atmosphere in buckets – as well as rain!